The Celeb® 850 LED DMX joins Kino Flo’s family line of LED soft lights. One of the largest LED’s in the industry, the Celeb 850 measures 114 x 65cm, but only uses 2.2A @ 230VAC. The Celeb 850 has three Menu options, one white and two color menus. Those who prefer to work with white light can use the "white menu" that gives the user access to Dimming, Kelvin and Green/Magenta control channels. Kelvin range is from 2700K tungsten to 6500K daylight. In the color menu, the Kelvin range travels from 2500K tungsten to 9900K daylight, and Kino Flo has set up a fourth channel called Gel. The Gel channel includes Kino Flo presets such as blue and green screen, sodium vapor, mercury vapor and over 100 well-known lighting gels. In addition, there is also a fifth channel called Hue Angle and sixth channel, Saturation. These two channels behave similar to a traditional color wheel, where you have white light in the center, and the Hue angle determines the color along a 360-degree range, and Saturation determines how much color is applied. The second color menu provides individual red, green, blue (RGB) control. The RGB menu is a great way to work with apps with predetermined RGB presets or color wheels. Kino Flo's Celeb 850 LED also comes with standard DMX and wireless DMX (Lumen Radio®), and universal voltage input 100-240VAC. We also recently added new SnapBag Softbox and SnapGrid accessories. The Celeb 850 LED DMX operates on universal AC power or battery power and needs only 2.2A (230VAC). The Celeb LED’s cost savings from low energy and long lamp life continues Kino Flo’s reputation as an environmentally friendly lighting company. The Celeb 850 LED DMX is comprised of a rugged metal alloy fixture which includes state of the art electronics with onboard and DMX dimming and runs universally at 100-240VAC or 24VDC. With three menus, White and two Color menus, presets can be fine-tuned to custom settings from 2700K to 6500K in the white menu and custom settings from 2500K to 9900K in the color menus. In the white menu, the user has access to Green/Magenta control. In the first color menu, there are three additional channels, Gels, Hue Angle and Saturation. In the second color menu, the user has access to individual Red, Green, Blue (RGB) control which works great with Apps with predetermined RGB presets or color wheels. Light levels do not change when selecting Kelvin settings and there is no color shift while dimming. Slim and lightweight in design, the Celeb LED includes a removable honeycomb louver. The molded corner accessory holders can also be used as a 4-point rope hang. With wireless capability, the Celeb 850 LED can be operated DMX wirelessly as an alternative to DMX cables. 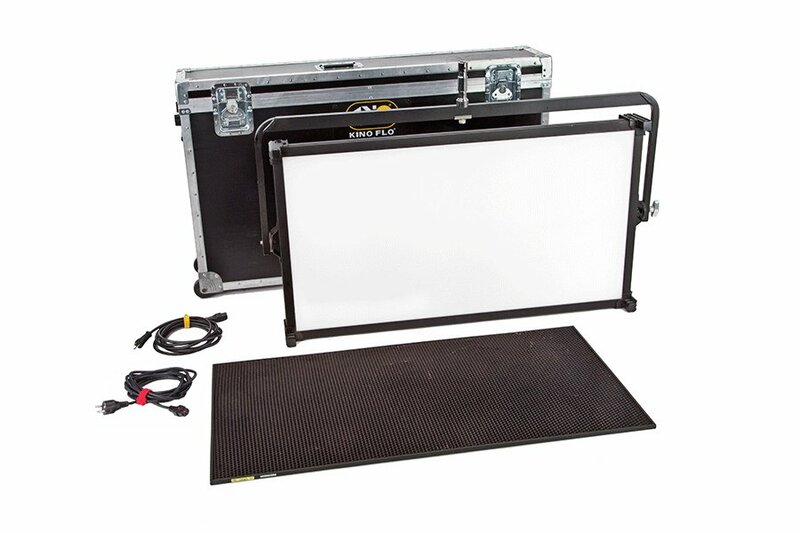 The all-in-one design with universal VAC and 24VDC and DMX operation makes the Celeb 850 LED a versatile and portable tool whether it’s in the studio or on location. The versatility of the Center Mount design allows 360° of unrestricted mounting. The baby receiver lollipop can mount directly onto a baby stand or hang from a grid with a baby pipe clamp. Other baby lollipops are interchangeable for further flexibility. The Yoke Mount fixture includes a welded alloy yoke bale offering unlimited orientation of fixture movement to focus the light when lighting from a grid. The Pole-Op Yoke includes an attached junior pin and offers advantage of lighting from a grid and eliminating the need for ladder access or costly automated rigging and hoist systems. Rated lifetime is up to 50,000 Hours. With its long LED life, the Celeb’s unique design will maintain its color-correct color temperature. As with all Kino Flo products, the Celeb 850 LED has been specially formulated to match the spectral distribution curves of today’s HD film and video equipment. The Celeb LED has a high color rendering index of CRI 95. Even while dimming, the fixture is flicker-free and without color shift. The Celeb 850 LED's unique design operates coolly, consumes very low energy (2.2A, 230VAC) and is properly ventilated to maintain a stable color temperature. A well maintained temperature extends the lumen maintenance, color temperature and life of an LED. With the push for reducing fossil fuel consumption, TV studios are looking at cooler more efficient lighting systems to reduce the costs and save energy. Part of this process involves generating energy values to determine savings. One of the most important values is Btu/kWh. The Celeb 850 LED includes a 90° Honeycomb Louver. The Kino Flo Honeycomb Louver controls and focuses the light which narrows the light spread with minimal light loss. A 60° Honeycomb Louver is also available (see Accessories tab). The spring loaded accessory channel holds up to two the Louvers. The SnapBag accessory is a lightweight fabric tailor-made for the Celeb 250 LED. It slips over the fixture and is attached with straps. The reflective material intensifies the soft light. The removable grid cloth attaches to the inside with Velcro. The Celeb LED's DMX operate on three DMX channels (in White mode) using DMX512 (six DMX channels in Color mode). The first channel operates dimming; the 2nd channel operates Kelvin color temperature control; the 3rd channel operates the Hue. The Celeb LED's DMX include a built-in Lumen Radio receiver and can be operated wirelessly with a Lumen Radio transmitter (sold separately). Wireless is an option to using DMX cables. For more information on Lumen Radio Receiver/Transmitter, see www.lumenradio.com. The Kino Celeb LED DMX includes state of the art features; dial-in variable color temperature control; full-range dimming without color shift; programmable presets; three menu options, one white, two color menus and special effects menus. The “white menu” gives the user access to Dimming, Kelvin, and Green/Magenta control channels. Kelvin range is from 2700K to 5500K. The FX (Effects) menu provides access to popular effects such as Candle, Fire, TV, Police, Lightning, Paparazzi, Pulse and Scroll. When on the desired effect, there are several pre-sets as well as control parameters that can be altered. For example, in the Lightning effect there is a “Storm” and “Frankenstein” preset, but it is possible to change Rate to provide additional variation. Candle - a candle flame with two settings,“Interior” and “Breeze”. Fire - Light mimics an open fire with both “Firepit” and “Gas Fireplace”. Police - up to five types police and emergency vehicle flashing lights. Lightning - lightning flashes with “Storm” and “Frankenstein” modes. Paparazzi - random still photo camera flashes with “Red Carpet” and “Stalker” modes. Pulse - Repeats colours, such as flashing neon signs etc. Scroll - Simulates color changing light over a period of time.